With Eventus you can configure any theoretic flow diagram by means of an easy-to-use flow designer module. 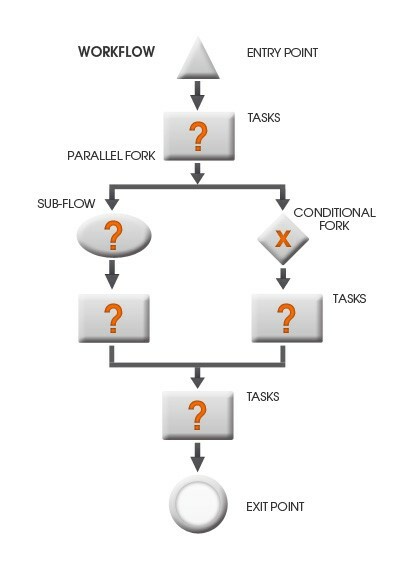 In flow designer you can apply all workflow components (conditional or parallel fork, sub-flow, etc.) used in general process models. Advanced tools are available to help create the various elements of complicated workflows, and changes can be kept track of both in time and across different alternatives. In this way, Eventus can also serve as a central store and archive for a company’s business processes. Here is what you gain with Eventus Workflow Management. High performance Eventus is an extremely high load capacity system with the ability to control hundreds of thousands of tasks a day and support several thousand concurrent users. Flexibility Easily manageable graphic tools are available for setting up workflows and tasks. This allows the enterprise to gain real control over its processes and to make them transparent and manageable. Closed-loop system A further significant advantage of professional workflow management is that business processes can be entirely followed in a fully closed loop. The system will always perform the workflows in accordance with their design and pre-defined settings. This reduces the risks of human improvisation and allows permanent feedback for workflow analysis and optimization. Integrated with Workforce Management A major disadvantage of standalone workflow systems is that they have to handle all execution externally. Integrated Workflow and Workforce Management can significantly improve the performance of corporate resources, both human and technical. Integrated workflows across the company A further major benefit is that Eventus can support business processes as an integration platform within the enterprise infrastructure, i.e. it ensures the co-operation of individual systems on an EAI basis. Automation Through systems integration and the managed network, the company can have the majority of tasks performed with the human factor eliminated. This provides a significant time saving in the carrying out of individual tasks and also ensures increased execution accuracy. Here are some examples of processes you can manage with Eventus. With Eventus, you can follow customer or internal fault reports through their entire lifecycle. Fault reports can either be entered directly into Eventus, or reach the system through on-line interfaces from other applications. For instance, you can have a single company portal for customer access, with Eventus gathering the fault reports from this system. In addition, Eventus can also be connected to your Network Management System, automatically receiving escalated network warnings and create fault tickets for them. Either way, faults will be managed according to their origin, type, area, customer value, technology or any other parameter you specify. The system will professionally manage task execution, due dates, customer time arrangements, escalations, etc. – everything you need to ensure customer satisfaction. As a further invaluable feature, group fault handling is also available to manage common faults together. If, for example, a switch goes wrong, thousands of customers connected to it will report the fault. Nevertheless, there is still only one fault to be repaired. Eventus assigns the individual fault reports to the group fault, manages everything in one process, and produces full documentation and full workflow support for each ticket. Eventus can fully manage both individual customer requests and internal provisioning for capacity management. As with other workflows, the input of requests can be done both internally (within Eventus) and externally (in other systems, transferred through an interface). A special feature of provisioning processes and one that can have real added value is the extensive potential for automation. A large proportion of provisioning tasks require only one human decision, or indeed none at all. There is no reason for doing all of the work and administration manually when you need specify the decision parameters only once and can leave Eventus to implement the workflow instead. Depending on your internal business procedures, more and more processes can be carried out without human intervention. Eventus is not only for your back office. Integrated Workflow and Workforce Management is aimed at bringing all your processes and resources together, independent of where they are within the organisation. Directing task execution to a single channel, thereby increasing workforce efficiency. For example, this can enable your customer help desk to provide much more detailed and useful information. Rather than simply inform a customer that a fault “is under repair”, the help desk would be able to tell the customer when the technician is on his way, his expected time of arrival and the length of time that the repair is likely to take. Like any kind of processes, HR related processes can be managed with Eventus. Typically HR processes with predefined forms, with specific approval processes and rules are to be handled electronically. HR issues (processes) like Travel Authorization, Training Authorization, Headcount Requisition, Personal Revising, Holiday Requests, IT Right Requests, Surveys, etc. can be handled by Eventus. Tired of paper based approvals? Papers get lost? Approvals are untraceable? An approval takes several days, or weeks? With Eventus Workflow Management (optionally with a modern handheld (smartphone)) approvals can be boosted, traced, followed and paper can be forgotten.